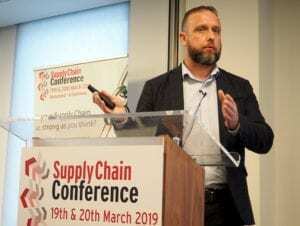 The Co-op has just gone through a major upgrade to its supply chain software and solutions specialist Barry Morgan explained how and why, when he spoke at the Supply Chain Conference on Tuesday. The retailer had been using a Manhattan WMS from 2004 and the decision was taken to upgrade to the 2015 version of the software. Morgan pointed out that one of the challenges was simply that a lot of people in the business didn’t think it needed to upgrade. As part of the process, the Co-op looked at all the systems in the business and categorised them in terms of risk. The strategy was to replace the old system on a like-for-like – not same-for-same – basis, with a single design for all 12 warehouses. To make the upgrade involved aligning processes across all the depots – which took some time to implement. Nevertheless, implementation of the upgrade was completed on time by the second quarter of 2018. Morgan highlighted some of the benefits of the upgrade. For example, the old system included lots of software modifications many of which were no longer needed. So with the new version it was able to reduce the number of modifications. Another benefit was that the new WMS has better integration with other systems, and it has also reduced unscheduled down time. 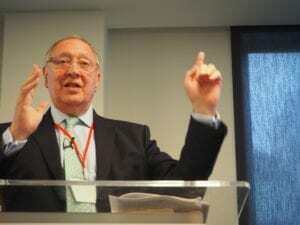 Patrick Rigoni, founding partner of SmartChain International, examined the demand driven adaptive enterprise as a necessary condition to reap the full benefit of digitalisation. To manage the supply chain you need data – we have lots of data but the reality is that only a small of the information you have is relevant. If you cannot identify this and include the wrong information in your analysis you will get the wrong conclusions. 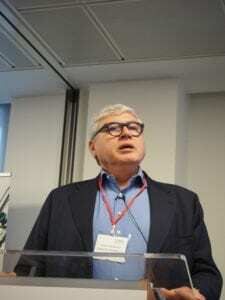 Rigoni highlighted key problems such as the bullwhip effect, and he looked at the benefits becoming demand driven. And he warned that without becoming demand driven, digitalisation could simply mean doing the wrong things more efficiently. The challenge of supplying global markets came under scrutiny when Procter & Gamble’s Onofrio Caradonna opened the Conference. The Global Distributor Markets (GDM) Supply Chain Synchronisation involved enabling business growth by creating a compliant and synchronised global supply chain to serve customers and consumers with a global portfolio, with the right quality, service and cost and cash, for P&G and its distributors. The Supply Chain Conference continues in London on Wednesday 20th March, when John Munnelly, head of operations at John Lewis’s Magna Park campus, will explain how the retailer is reimaging the world of logistics. And Jurgen Kull, HP’s director of supply chain operations EMEA, will discuss “Striving for excellence in Collaboration”.